We offer a large selection of IP cameras for use with your Bank location. These cameras can monitor lobbies, teller areas, ATM areas, and entrances as well as exits. 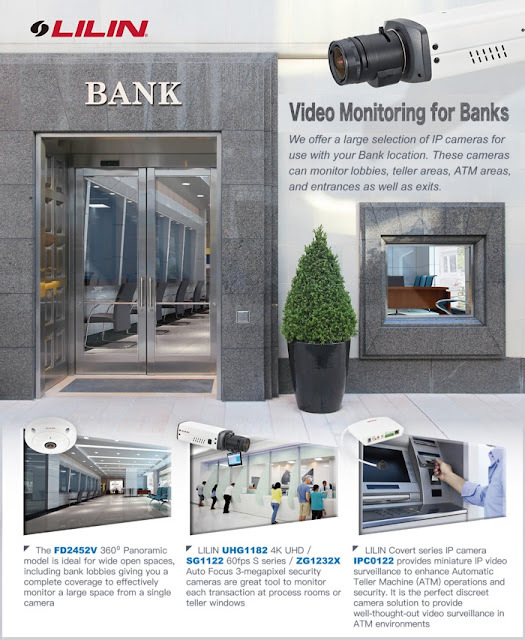 The FD2452V 360o Panoramic model is ideal for wide open spaces, including bank lobbies giving you a complete coverage to effectively monitor a large space from a single camera. LILIN UHG1182 4K UHD / SG1122 60fps S series / ZG1232X Auto focus 3-megapixel security cameras are great tool to monitor each transaction at process rooms or teller windows. LILIN Covert series IP camera IPC0122 provides miniature IP video surveillance to enhance Automatic Teller Machine (ATM) operations and security. It is the perfect discreet camera solution to provide well-thought-out video surveillance in ATM environments.